Tea Coffee and Hot Beverages: Get Up and Go! A blend I made for Matt. Get Up and Go! A blend I made for Matt. I said in an earlier post that I have nothing against tea that isn't "tea" or tea blended with things other than tea. Although I rarely drink blended tea myself that doesn't mean I can't enjoy it once in a while! This is the first time I blended some tea to package up. Usually if I do I stick whatever it is in the pot with the tea right before brewing. This time I had to make sure everything was completely dry and evenly mixed. I named the blend "Get Up and Go!" as it consists of yerba mate, which contains much more caffeine and theobromine than tea made from c. sinensis, ginseng oolong, known to be invigorating, homemade candied ginger, and dried orange peels. 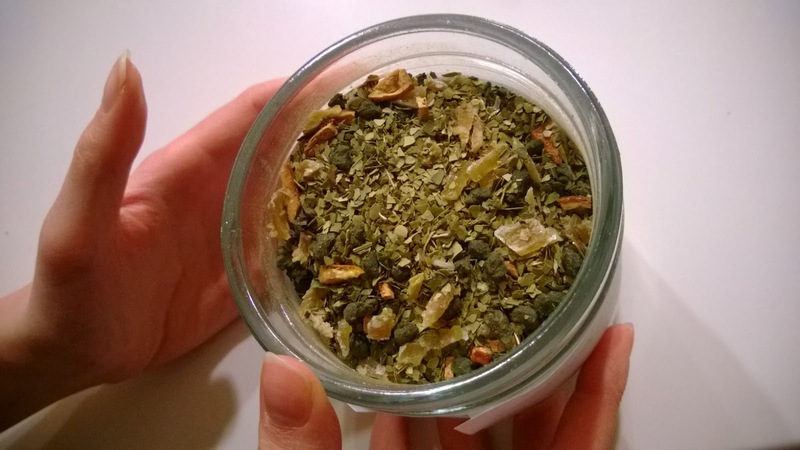 I added little of the last two ingredients as I wanted their contribution to the flavor to be subtle compared to the yerba and ginseng, though I thought their flavor would pair nicely with the overarching character of the blend. Yunomi, A Japanese tea place. They have even the rarest Japanese tea always at a great price.